Flatbread: one of the most commonly bought foods from the store, that is actually extremely easy to make yourself. If you’ve never tried making flatbread at home, you’ll be hooked. It’s such a simple dough recipe, and it’s basically fool-proof. And the best part, you can totally stray from the recipe I have below and simply use whatever toppings you please. My favorite way to do it is by finding all the produce that looks amazing at the farmer’s market and throwing it on top. 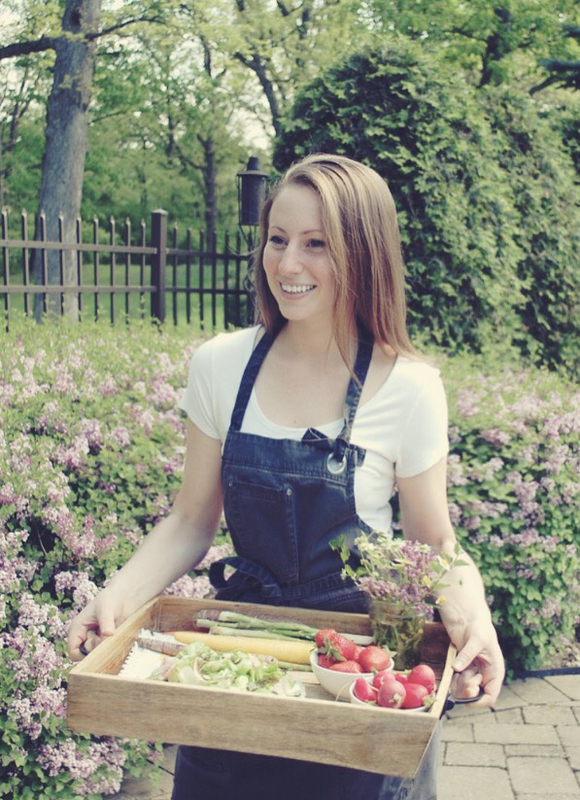 Especially in the summer, cooking seasonally is one of the things I love to do most. You can read all about my insights on seasonal eating in my Market Salad with Black Garlic Vinaigrette post. Ok, back to the dough. I pulse the flour, dry active yeast (which you can easily find at Whole Foods, or any other grocery store), salt, and sugar together in a food processor. Then the water is added in a slow, steady stream until the dough comes together. Easy as that. The dough will be a little sticky, so make sure to use a lot of flour on your hands and on the surface when flipping the dough out. You’ll knead it for a couple of minutes, set it in an oiled bowl, and let it rise in a warm place for 1 hour. At the end of the hour, the dough should have doubled in size. While you patiently wait, all of the toppings can be prepared so you are ready to go! And while you absolutely can change the toppings up however you’d like, I do recommend trying this spicy chorizo version. 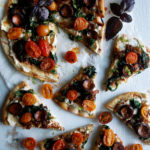 It’s got a tangy lemon ricotta for the base, plus all sorts of flavorful ingredients like caramelized onions, harissa marinated cherry tomatoes, garlicky spinach, the spicy chorizo, and lots of fresh herbs. 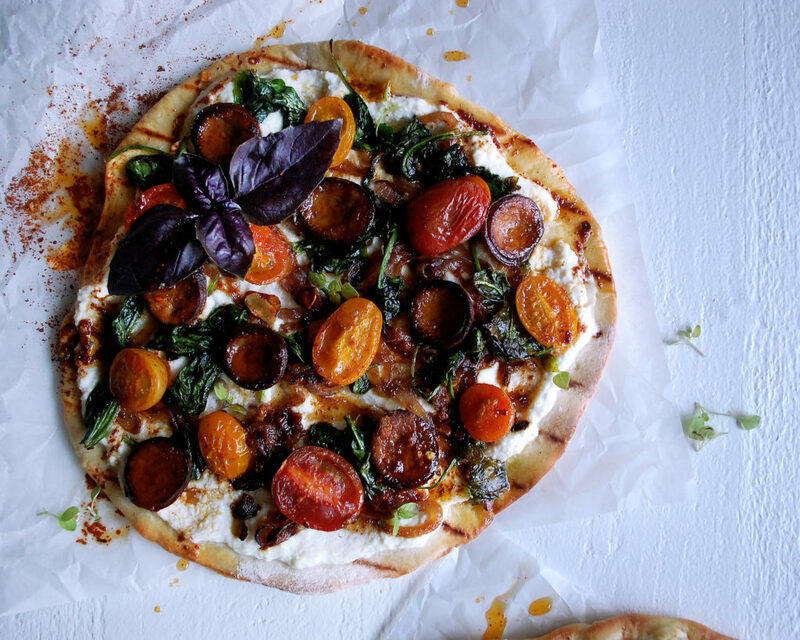 My favorite part is using the harissa oil from the cherry tomatoes as a drizzle for the entire flatbread…it’s bright red, smoky, a little spicy, and delicious. Once the dough has risen, it gets divided, rolled, and then grilled. I like to have my grill heated and ready so this process can go quickly. After that, the toppings are arranged on top and everything bakes for just about 5 minutes. Use a pizza cutter to slice each flatbread into 8 pieces, garnish with herbs, squeeze some lemon juice on top, and you’re ready to dig in! You can also cut this dough into smaller pieces and make individual-sized flatbreads. Perfect for summer entertaining. Enjoy! Pulse the flour, dry active yeast, salt and sugar in a food processor. Add the water in a steady stream until a ball forms (it will start to pull away from the sides). Flour a cutting board, as well as your hands, and knead the dough on the board by flattening it, pulling the sides over and pressing down. Continue to do so for a couple of minutes. Form the dough into a ball and place it in a large bowl that has been lightly coated with olive oil. Cover the bowl with a damp towel and let the dough rise in a warm place for 1 hour. Combine the ricotta cheese, lemon juice, and lemon zest in a mixing bowl and whisk until fully incorporated. Refrigerate until ready to serve. While the flatbread rises, prepare the toppings. For the red onions: Heat a large sauté pan over medium heat. Add enough oil to coat the bottom of the pan. Add the sliced red onions. Sauté for 5 minutes, stirring often. Lower the heat and continue to caramelize the onions until they are extremely soft and golden. Season with salt and black pepper. For the cherry tomatoes: Whisk together the olive oil and harissa in a small bowl. Add the cherry tomatoes and a pinch of salt, and stir to coat. Let the tomatoes sit at room temperature in the harissa oil until ready to serve. For the chorizo: Heat a pan over medium heat. Add enough oil to coat the bottom of the pan. Add the slices of chorizo. Cook on one side until golden brown and crisp. Flip each piece over and finish cooking. For the spinach: Heat a large sauté pan over medium-high heat. Coat the bottom of the pan with oil. Add the shaved garlic and cook for 30 seconds (don’t let it burn). Add the spinach and stir until it has wilted. Season with salt and black pepper. After an hour, take the dough ball and cut it into 2 pieces. Heat the grill to medium. Use a rolling pin coated in flour to roll each piece of dough into a thin circle. Place the rolled dough circles onto the grill. Cook until bubbles begin to form on one side. Use tongs to turn the flatbreads over and finish cooking on the other side. Remove from the grill and cool slightly. Preheat the oven to 475°F. Place the flatbreads onto a foil-lined baking sheet. Spread the lemon ricotta on top of each one. 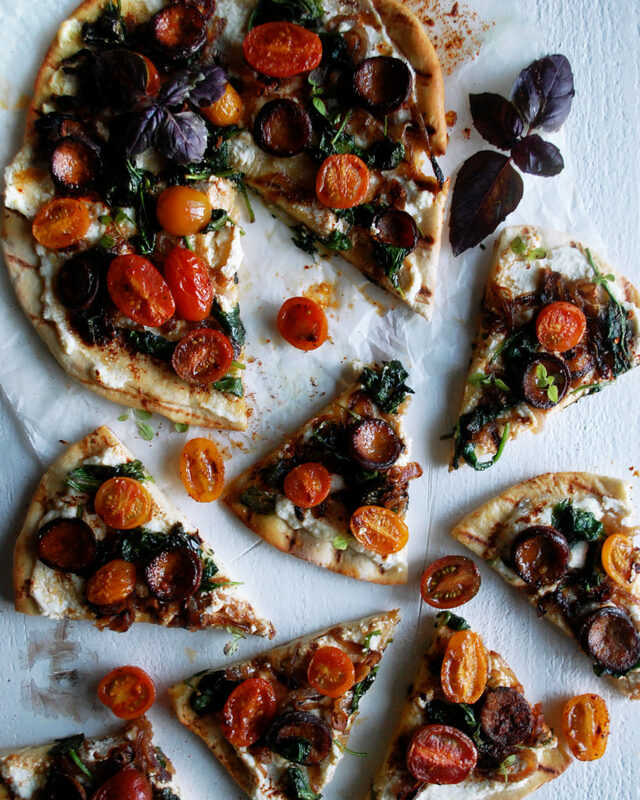 Divide the rest of the toppings between the two flatbreads, evenly spacing all of the ingredients. Make sure to drizzle the extra harissa oil from the cherry tomatoes onto the flatbreads as well. Bake for 5-6 minutes, or until the flatbreads are heated through and the toppings are sizzling. Let the flatbreads cool slightly before cutting each one into 8 pieces. Garnish with the purple basil, golden oregano, and a squeeze of lemon. You can cut the dough into smaller pieces to create individually-sized flatbreads.